Looking for a New Cadillac ATS Coupe in your area? CarGurus has 978 nationwide Cadillac ATS Coupe dealers with 2,140 new car listings. 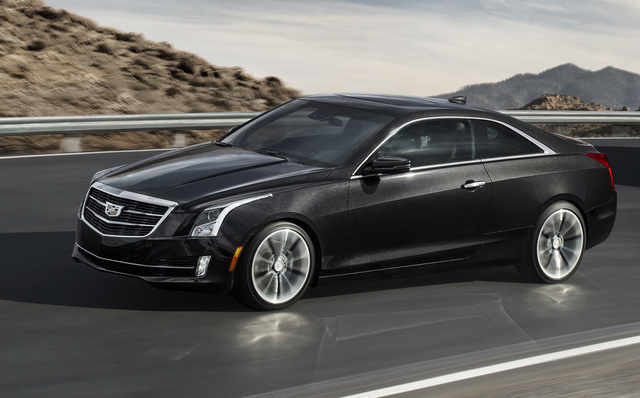 Now in its fourth year of production, the Cadillac ATS Coupe receives only a few minor tech and personalization updates for 2018. The ATS Coupe became the automaker's first compact coupe when it debuted in 2015. Despite differences in stance and exterior styling, the ATS Coupe continues to borrow powerplants, features, and a majority of design elements from the ATS sedan. New features for 2018 include a next-generation Cadillac User Experience (CUE) infotainment system with a revised, user-friendly interface and a new Summary View, which provides quick access to the coupe's audio, climate, navigation, and phone applications, including Apple CarPlay and Android Auto. The updated system also gives drivers and passengers the option of creating and customizing individual accounts for personalized operation, and the ability to integrate Apple Watch with the CUE system using the myCadillac mobile app for iOS. When integrated, owners can locate their cars in a crowded parking lot, lock and unlock car doors, start and stop the engine remotely, and operate the horn and lights, all with Apple Watch. Cadillac upgraded the heated steering wheel and seats from the previous year with automatic versions that monitor the cabin's ambient air to determine when to warm up. Finally, Cadillac offers the ATS Coupe in a new Satin Steel Metallic exterior paint color for 2018. Although the ATS Coupe rides on the same 109.3-inch wheelbase as the sedan, it stretches more than an inch wider, to 72.5 inches. To accommodate the wider track, Cadillac revised the Coupe's bodywork, equipping it with a wider front fascia, grille, hood, roof, and rear fender, as well as longer doors. Up front, it also displays the updated Cadillac crest that debuted in 2015. Short overhangs, subtle wheel wells, rising sidelines, and a clean, aerodynamic profile contribute to the Coupe's sporty good looks. A number of exterior features help improve the Coupe's aerodynamics and performance, including sculpted aero-profile side mirrors, bevelled taillights, and underbody shields, which channel airflow around the vehicle. In the rear, a trunk-mounted spoiler helps create downforce to improve grip and stability at higher speeds. Available active grille shutters close at higher speeds to reduce drag and improve aerodynamics. Like the sedan, the ATS Coupe comes in Base, Luxury, Premium Luxury, and Premium Performance trims for 2018. Standard exterior features include automatic headlights, daytime running lights, heated power exterior mirrors, and capless fueling. All trims except the Base also get high intensity discharge (HID) headlights with adaptive forward lighting—swiveling the headlights around curves and when turning to provide optimal illumination. The Premium Luxury and Premium Performance trims come equipped with additional exterior features such as illuminated door handles and rain-sensing wipers. All Coupe trims ride on 18-inch alloy wheels with run-flat tires. The four ATS trims are powered by two different engines. A 2.0-liter turbocharged 4-cylinder powerplant drives the Base and Luxury trims. 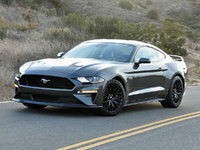 It generates 272 horsepower and 295 pound-feet of torque, with very little turbo lag and plenty of pull for zippy acceleration and responsiveness. Owners can pair the engine with either an 8-speed automatic transmission with magnesium steering-wheel-mounted paddle shifters (standard), or a 6-speed manual transmission for a more visceral driving experience. 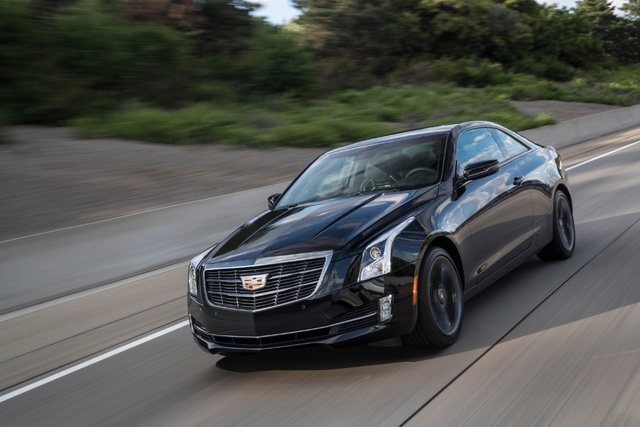 Cadillac says the Coupe makes the jaunt from 0 to 60 mph in about 5.6 seconds with the automatic. An auto start/stop function helps ensure good fuel economy of 22 mpg city, 31 highway, and 26 combined for the Coupe's base rear-wheel-drive (RWD) configuration, and 22, 30, and 26 when equipped with optional all-wheel drive (AWD). The Premium Luxury and Premium Performance trims take a step up in the power department, thanks to a 3.6-liter 6-cylinder pumping out 335 hp. Torque drops slightly with the 6-cylinder, to 285 lb-ft. The bigger engine links to the 8-speed automatic transmission only. Like the 4-cylinder turbo, the 6-cylinder features auto stop/start and Active Fuel Management, which combine to keep fuel economy numbers relatively decent, 20, 30, and 25 with RWD (slight drop with AWD). The ATS Coupe tips the scales at just 3,418 pounds, making it light on its feet. The low weight, as well as a sport-tuned suspension, standard on all trims except the top-level Premium Performance, provides agile handling and a dynamic driving experience. Standard features on all trims include performance-tuned electronic variable-assist ZF steering, Brembo front brakes, and GM's StabiliTrak electronic stability control system. The Premium Performance trim upgrades to an adaptive performance suspension featuring Magnetic Ride Control, which makes continual adjustments to each individual wheel for optimal ride and handling. The Premium Performance trim also comes standard with a limited rear slip differential and a larger engine cooling system for performance driving. Inside, the Coupe accommodates four passengers in its upscale cabin, with plenty of headroom and legroom in the front. Adults may find a tight fit in the second row, but all will appreciate the comfortable seats and high-quality materials throughout. Standard features mimic the sedan's and include a leather-wrapped steering wheel, push-button start, dual-zone automatic climate control, reversing camera, and a 12-speaker Bose audio system for all trims. The Base also comes equipped with leatherette upholstery and 6-way power-adjustable front seats, as well as the new CUE system with an 8-inch touchscreen, satellite radio, Bluetooth, and wireless charging. All other trims upgrade to leather upholstery, 10-way power-adjustable heated front seats with memory settings, and the new automatic heated steering wheel. Technology upgrades include advanced CUE system with navigation, voice recognition, and three USB ports. The Premium Luxury and Premium Performance add aluminum sport pedals and a power sunroof, while the top-line Premium Performance gets a powered tilt/telescopic steering wheel and a head-up display. Safety features for all trims include eight airbags and a variety of OnStar services. All, except the Base, also get a front and rear parking assist feature. The Premium Luxury and Premium Performance receive a number of additional safety features, such as forward collision alert, lane departure warning with lane keep assist, blind-spot alert, and rear cross-traffic alert. The National Highway Traffic Safety Administration (NHTSA) awarded the ATS a top-level 5-star safety rating. What's your take on the 2018 Cadillac ATS Coupe? Have you driven a 2018 Cadillac ATS Coupe? Enter your zip to see incentives for a new ATS Coupe in your area. Looking for a Used ATS Coupe in your area? CarGurus has 952 nationwide ATS Coupe listings starting at $13,400.